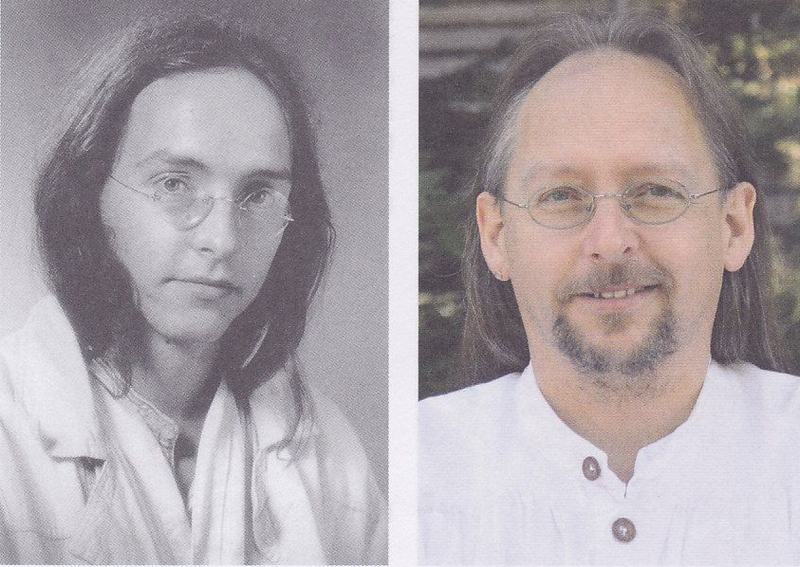 Hans-Georg Lanzendorfer; left: 15/08/1987, right: 3/10/2010. 5 How groups impend to fail! An approximately 30-year membership in FIGU’s core group is undoubtedly a long time. Nevertheless I filed the request for a 3-year break from the group-life in February 2014. This was due to internal tensions, serious differences and disputes about the organizational structure. As a result of further unwarranted remarks, incidents and accusations against me, about a year later, it was definitely no longer possible to maintain my membership in the FIGU core group. I handed my letter of resignation personally over to Billy in March 2015. After several questionable incidents, the adjective ‘free’, in the statutory naming of the club (FIGU), had given me a peculiar and bitter aftertaste. The often contradictory and absurd rules of conduct, regulations and decisions became for me, in their complexity, too constricted and unfree. To have a constant and uncomfortable feeling in the back of your head because you might offend against a code of conduct or directive while walking through the clubs premises, became an unbearable burden to me. At the end I probably violated constantly against the rules, without even being aware of it. The sudden incompatibility of my own mind and way of thinking, and the upheaval against the many rules, the strict regulations and binding decisions of the ‘free’ community of interests, were for myself a new and strange experience. Basically, it is for me personally a very important point that my emotional exit from the core group is publicly not made a big deal. Finally, my farewell is neither based upon a critique of the teachings of ‘BEAM’, nor on his contacts with the Plejaren. This must be made quite clear. Rather the unmanageable rules and regulations, as well as certain stoic and pragmatic behavioral structures of the organizations management became an insurmountable and constricting obstacle for me. As with the departure from Hinterschmidrüti so should my name disappear into oblivion, while I am being immersed in my native garden and bosom of my family. It is a real horror for me to post this statement, which was not planned in this form. I was quite aware of the management’s internal dealing with critical expressions and conflicts. Public insults towards me were, and unfortunately are, expected to continue. The publications in the contact reports about me being allegedly reprehensible, arrogant, egoistic, selfish, disloyal and power hungry, I initially took note of them with stoic calm. The attacks and stigmatization about my person were clearly predictable. The organization FIGU itself provides the right to the freedom of expression. Quote periodicals: According to Universal Declaration of Human Rights December 10, 1948, Article 19, expression and information: Everyone has the right to freedom of expression; this right includes freedom to hold opinions and to seek information and ideas through any media, regardless of frontiers, to receive and disseminate information. Therefore, it is for me quite scary to read that my own opinions, views and values are condemned by FIGUs executives as dominant, selfish, and rebellious with lust for power. With this allusive judgement, my resignation from the core group is reduced for their own protection, by degrading my psyche and awareness. This is an elaborate, psychologically dubious but clever move by the executives in charge. This enables them to incapacitate me in advance of any qualification for self-defense, by expressing a critical opinion about the system. Ultimately my separation from FIGUs association is based upon the amount of countless insights and many years of experience. Quitting the core group is of course no lighthearted decision. Such a serious step was not committed by me out of pure listlessness or due to superficial moodiness. For me personally, it was ultimately the inevitable consequence of multiannual concatenation of decisive events, formative experiences, educational experiences and emotional disputes about the organizational structures with the leadership of the organization. People go through changes. They learn and develop, gain new experiences and together search for new ways and for transformation – Relegeon (=the rejoining to rightness). One of my personal findings is based on the fact that even groups and organizations should develop. My allegation, that FIGUs leadership restricts such development and changes within the organizational structure by a monocratic leadership style, is certainly true. In this respect, I recently published my thoughts on my Facebook profile. However, the writing was also submitted in advance to the FIGU bulletin editors for publication. To date, they have not yet responded. https://www.facebook.com/notes/hans-georg-lanzendorfer/woran-gruppen-zu-scheitern-drohen/1778559485706711. The phenomenon of ‘group-thinking’ in the center, as described in my article, has over the years been proven to me as factual. Contrary to the allegations against me, my initiatives and suggestions for the implementation of new ideas and structural changes, were never based on malicious attempts to dominate the CG (core group) members. Nor was it never intended to take over the management or even the leadership of the organization. This accusation and insinuation is completely nonsensical. FIGU has in my opinion reached a turning point in its stage of development. Through the strict conservation of old traditions and laws, it has bogged down in a one-way-street of immobility. The permanent pressure of night-watches, morning-watches, Sunday services, lectures and information stands, gardening and landscaping, as well as group meetings on weekends, personal meditations as well as group meditations, writing the publications, correction of publication evenings and the printing of the regular publications and the maintenance of the entire IT infrastructure etc., etc., has increasingly shown its toll on the members health. In reality all the ones who constitute the core members, who also have daily jobs, are nowadays all overworked and overwhelmed, handling the diverse tasks and obligations of the organization. Therefore the joining of new and reliable core group members cannot be expected. The sick-related absences of CG-members have multiplied remarkably in the past. Years ago I wrote a letter outlining this situation to the president of the organization – without ever having received any response. About three years ago and in accordance to my considerations and practical requests, the time has come to loosen the restraints of numerous commitments and services of the core group and adapt them to the potentials and resources of the senior members. My critical and unconventional suggestions for changes in the organizational structure, duties and responsibilities, should have naturally relieved those members. In my view, the numerous, extremely comprehensive and sometimes contradictory decisions, regulations, rules and guidelines have grown over the years to a cumbersome and hindering task. Those should be overhauled right away and be adapted to suit the current requirements. Meanwhile, the FIGU is 40 years old. The manual with the personal obligations of the members grew considerably. Undoubtedly, many policies have been proven. However, some of it has long been ‘old hat.’ An adjustment to the actual requirements for the clubs conservation and the member’s needs is long overdue. For my initiatives and transformational efforts, I am in the new contact reports labeled as power hungry and disobedient, going against the statutes and the decisions of the organization. In reality it was never my intention to suspend the decisions and rules of FIGU or overthrow them. At the core of my concerns, only stood the request for certain changes and facilitation. Those should have enabled members to continue with their services and duties in a relieved or simplified form. Because of my ideas and renewal proposals, I am in the contact reports accused of defamatory conspiracies and cited dishonorably as a ‘troublemaker’. The active core of the 49 aggressively dwindled since my foray in 2014. At least six long time senior members have left the core group in the past two years. The reasons for me leaving the core group are also based upon other considerations. According to my own observations, a no longer acceptable, or tolerable, culture-of-insults has developed within FIGU against dissidents. The snubbing, hurting-of-feelings and hurling of insults against humans, has to my understanding, grown extensively in the associations publications as well as in the center. Regretfully, even sympathizers, interested people, or members of like-minded organizations are insulted and offended in the writings and periodicals of FIGU as stupid, brain-amputated, ludicrous, idiotic, confused, foolish or insane etc. However in OM canon 32, verse 2393 it is stated: Always allow thy enemy, the guilty and the losers to talk. Canon 31, Verse 505. One must even giveth an enemy hospitality when he cometh into the house, like a tree that shades and protects the one who cometh to cut it down. Obviously this wisdom has room for interpretation. This degrading condemnation and insult of people – even in the contact reports, is another fact, I criticize openly. This subject was also part of my last conversation with the president. The open public insults, degradation and stigmatization in the contact reports about the members who left the organization, demonstrate and substantiate in a hard way my observations, statements and allegations in regards to the management. This can be confirmed in the contact reports by a highly one-sided interpretation and without any apparent reflection of their own shortcomings and errors, an impeccable management style that is suggestive and influential. The superficial condemnation and insults of the exited members in the contact reports is not comprehensible for me. However, the uncompromising solidarity of the Plejaren with the contact person is somehow understandable. One gets to know the personality, character and views of a person by direct contacts, in meetings, in conversation and through verbal exchanges. Everyone should have the possibility and the opportunity to express and describe their opinions. Everyone has the right to present their own findings, arguments, views and causality about their personal opinions. Just as FIGU reserves that right for itself. Contrary to all the insults and denunciations against the members who resigned, the following needs to be considered: Every former member of the core group is, and remains, a venerable and sincere personality. The final decision to leave the core group, of the 49, doesn’t automatically declare those human beings as ‘persona non grata’ (Latin, plural: personae non gratae, literally meaning “an unwelcome person”) Not even if they are described and displayed as such in the contact reports. The ones who left are by no means the crazy-5er-troop with the malicious intention to cause FIGU harm. We are all honorable people with our individual experiences, insights and knowledge. For not one of those affected was it easy to take the decision to leave. For a long time, we all have wrestled with ourselves. Ultimately, no one has found any other feasible way for himself. There was no conspiratorial agreement nor mutual incitement with one another. For me personally it was basically clear to never publicly degrade the doctrine nor the ufological backgrounds of FIGU. This fact is also in accordance with my aforementioned dispense writing. For my part, there will hardly appear a book about my almost 30 year’s membership in FIGU. Likewise, no public interviews will be given about my motives for the break and separation with FIGU. This text is and remains my only statement. Basically, it was written by me reluctantly and in a sense as an act of self-defense. As a result, to the expected and inevitable defamation against my person in the contact reports and future publications by the organization. In my opinion, the dust should have been simply settled on this thing and silence prevailed. Instead, the exasperating matter of my resignation from the core group, was several times unnecessarily dragged into the new contact reports by FIGU with some very defamatory statements against me. In case of a later publication in book form, these reputation damaging statements against me could have indeed legal consequences and result in a defamation law suit against FIGU. The verbal and written attacks against supporters and sympathizers of FIGU, and the deadly blows within their own ranks are a mystery to me. They undoubtedly lead to an organized and self-generated dismantling of their own organization. Not one of the resigned members has the serious ambition to deliberately harm FIGU. Taking this into consideration, it is part of FIGUs human tragedy to disgracefully insult all those honorable men who are faithful to the mission. My essence continues searching, although the truth I found, do not want the faiths pillow, nor the captivating band of humility, nor the wisdoms illusory-garment which some unabashedly put on; it remains – the desire to attract life’s deepest gist. After a 28-year membership in the CG of 49, taking the following decision was not easy. According to the contact report no. 581 of February 3, 2014 my review and the impetus for the openness to structural changes for the FIGU team is seen as the result of a ‘massive negative influence’ and my own critical and certainly also creative and benevolent thoughts to the development of FIGU devalued. However, it is not my intention to jeopardize the FIGU. As a result of these suspicions expressed by Ptaah and the disqualification of my own experience, it is better for the safety of FIGU, to take my immediate walkout for 3 years. The monthly contributions will continue to be paid by me. Basically, it is important for me to let you know about my absolute solidarity towards our common mission, Billy’s prophethood or teachings. However, the narrowness and the ‘dogmatism’ within the club’s structures rob me the air to breathe. It is now about time to reconsider and become aware of my role and situation within the FIGU. In this regard, it is also not possible for me to participate for health reasons in the activities of FIGU or to fulfill my duties. My dispensing is with immediate effect. Since my first encounter with the FIGU about 30 years have passed. It was an informative and intensive time. I am sorry that we have now arrived at a point where we part ways. My attitude towards the internal structures, the manners, the conflict and leadership culture of FIGU, has grown critical over the years. Presenting constructive solutions and desirable changes for FIGUs system, are condemned as a failure, insolence, foolishness, arrogance or stubbornness etc. Self-critical considerations and solution-oriented practicality are obscured in the FIGU as well as in the contact reports. Instead insults and devaluation of the accused as well as a one-sided and judgmental description of the issue is the rule when the opinions and views do not correspond to the basic tenor of FIGU. Our points of view and approaches can no longer be reconciled and will only end in allegations. For this reason it is better to comply with the 6-month period of notice given at the end of September 2015 and hereby submit my resignation to the CG of 49. My financial obligations will continue to be met by me during this period. How groups impend to fail! Team decisions have a higher status nowadays than the decision of one team member. In the complex business life of today it is vital to work together in teams and communities because teams are more creative and productive etc. than single individuals. However there is also a danger in this because of the phenomenon ‘groupthink’. This is a process in which a group of competent individuals makes worse decisions than the single member would make under normal circumstances, because everybody adapts to the group opinion. People are always looking for a personal identity, and people who share their sentiments, views and opinion. Groupthink is a certain thinking mode of people in a community. Groups frame limits in the form of clear rules, specifications, instructions and behaviour. They strive to defend their existence and work against outsiders and praise their own activities. This way groupthink in the form of a blind acceptance and defence of the group identity and opinion quickly becomes a doctrine. Opinions of individuals, conflicts and controversy are unwanted and are stifled in the bud to achieve a consensus on this basis. Still it is possible the group members feel comfortable this way because they feel very connected to the group (the ‘we-feeling’), while thinkers, initiators, reformers and critics within the own ranks is labelled as troublemakers. The group isolates itself from others and outsiders and other opinions. No systematic methods are applied to solve any difficulties. The group is being led by a ‘strong’ leader figure by a dictating leading style who strongly influences the way of thinking of the members. This way of progress retardant Groupthink is indicated by a number of symptoms like the illusion of invulnerability and superiority, self censoring etc. Who thinks along the lines of the leader or leadership belongs to the ‘in-group’. Who thinks differently, criticises etc. belongs to the ‘out-group’. Hans-Georg goes on to elaborate on the Hawaian custom Ho’oponopono’ (a method to solve conflicts in families and groups) and the principle of Advocatus Diaboli (devil’s advocate). Hans-Georg clearly implies with this article that the Groupthink phenomenon is present within FIGU, with Meier being the ‘strong leader’. Source: Woran Gruppen zu scheitern drohen!